A rendering of the SoccerCity stadium. Courtesy FS Investors. The development group behind the proposed SoccerCity development in Mission Valley said Thursday they made both land and stadium concessions in an effort to get San Diego State University on board with their project. For the first time, developers revealed specific offers they made during discussions that went through the office of Mayor Kevin Faulconer. SDSU announced Tuesday they have cut off negotiations with the developers about plans to redevelop 166 acres at Qualcomm Stadium. The developers said the two sides hadn’t met directly in several months. Nick Stone, project manager for SoccerCity, told City News Service that if SDSU joins them in a joint venture by Dec. 1, the school will receive 12 acres for a stadium for the Aztecs football team, plus five more acres adjacent to the playing facility. — SDSU could purchase 30 acres in 30 years, at fair market value, to use for university purposes. The school asked for 12 acres for a stadium and 35 acres for campus expansion. Stone said the last option, combined with the stadium, would satisfy that demand. “Quite honestly, these are painful concessions,” Stone said. The group, led by La Jolla-based FS Investors, has applied for a Major League Soccer expansion franchise, so the proposed stadium would house both soccer and college football. Stone said, if SDSU joins with them, capacity would be 33,500, of which 1,500 would be standing. That size is on the high side of what MLS officials will accept, he said. If SDSU doesn’t join in with the project, the stadium capacity would be 23,500. It would still be made commercially available to SDSU, since the team might not have a place to play after the 2019 season. Petitions circulated in favor of an initiative crafted by Stone and his partners are being verified by the county Registrar of Voters office, and results are expected by next week. If enough signatures prove valid, the San Diego City Council will be required to adopt the project outright or place it before voters, likely in a special election in November. Stone said the offers to SDSU are not in the initiative, but would be part of a binding lease agreement with the city that would be made public before the election. Several other facets of the lease wouldn’t impact SDSU. Among them, the acreage of a proposed river park would rise from 55 to 60, the purchase price of the land would be revealed before the election and eight community meetings would be held about the project — six before an election and two after. He said the project won’t go forward if the MLS denies their application for an expansion franchise. “We will deliver soccer or we won’t start,” Stone said. In a statement, the mayor said his goal in negotiations was to protect the city’s interests and make sure the public gets a fair deal. SDSU’s statement on Tuesday said negotiations were being cut off because “a fair, equitable deal” couldn’t be reached. 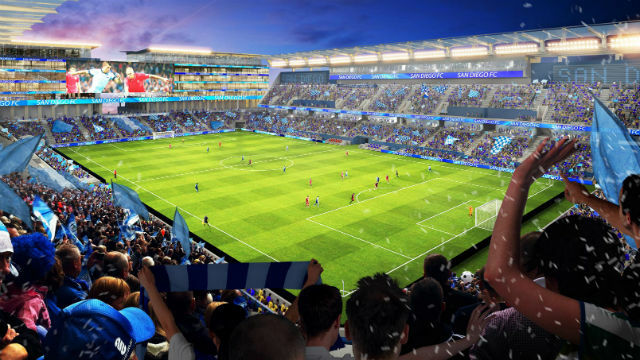 The SoccerCity backers also include investment manager Mike Stone, former Qualcomm President Steve Altman and Peter Seidler, part of the Padres’ ownership group, among others. The Stones are not related. Altman is a major SDSU booster and fundraiser.